Recently our new governor, Mitch Daniels, changed Indiana back to recognizing Daylight Savings Time. That wasn't too bad. However, it was up to the U.S. Department of Transportation to decide which counties would be in what time zone. The people who decided must have been on crack. The county I live in, Lawrence County, was placed in the eastern time zone and Martin County, the county I work in, was placed in the central time zone. If you look at an Indiana map you can see the ridiculousness of it. The jist of this is now I have to come home in the dark for 3-4 months of the year. The naval facility I work at maintains grassy barriers along the roads. This grass is where the deer love to graze after dark. Lots and lots and LOTS of deer. Like all vehicles I've owned, the factory Liberty lighting leaves a lot to be desired...especially when you're on 'deer alert'. I purchased some Hella offroad lights but for the life of me could not find a decent place to mount them. 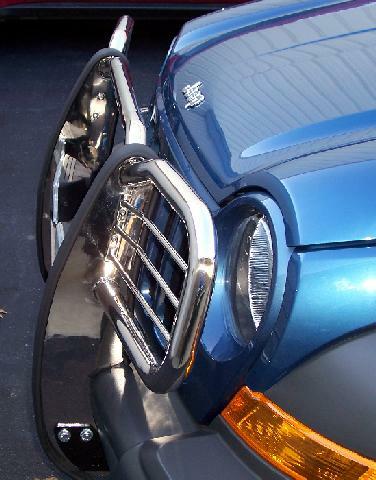 One day I was checking out Ebay for Liberty stuff when I found a grille guard. 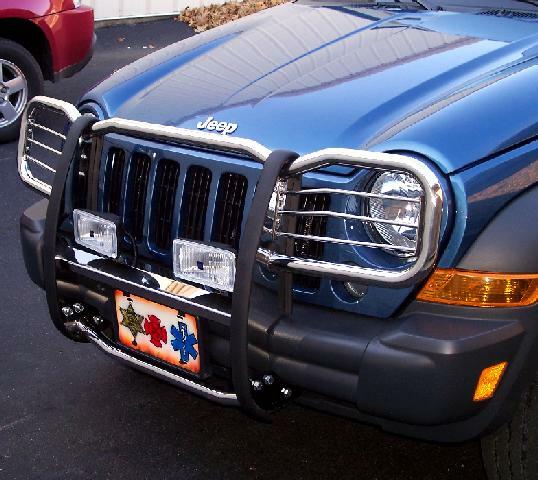 It was a full stainless steel Smittybilt grille guard that covers the headlights and everything. It also had mounts for lights. Hmmmmm. It was brand new and ended up getting the thing for next to nothing. 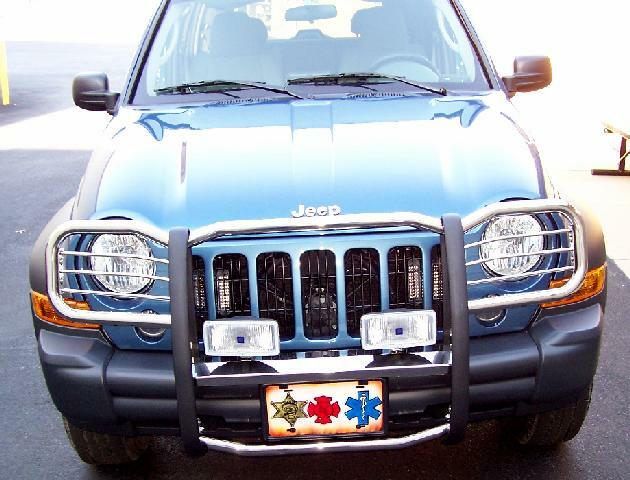 I'm not normally a big fan of the full grille guards but since I'm now running the deer gauntlet I figure it can't hurt. 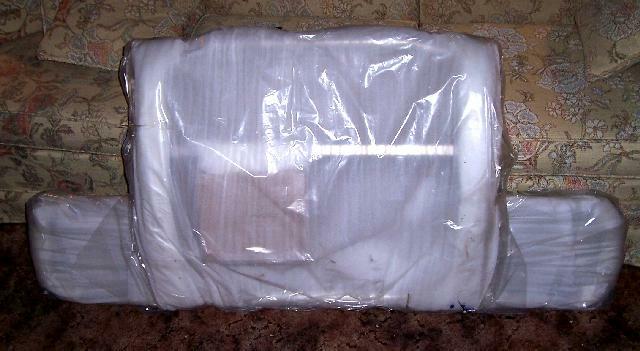 The grille guard (P/N 35204) came well packaged. 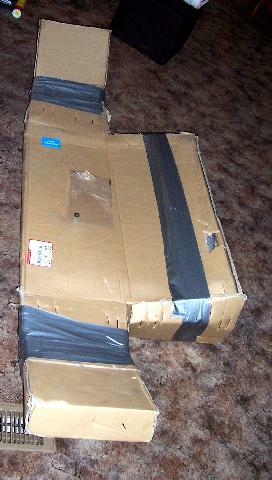 The Ebay seller tacked on a large shipping charge for freight delivery due to the size of the guard. I was a little miffed when I saw it had come UPS instead of freight, but I stilled ended up paying a third of the cost of a store bought grille guard. It was well wrapped, too. The Ebay ad said it didn't come with instructions, and it didn't. No problem as it is simple to install. 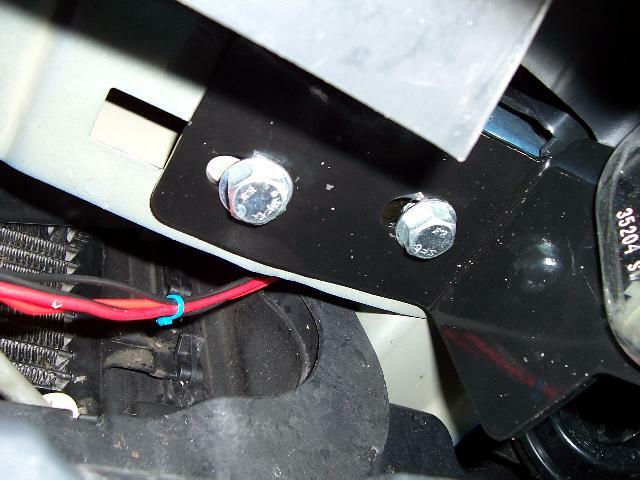 Remove the tow hooks (the only negative of the grille guard), slip the backstraps in place, and bolt the mounting brackets on. 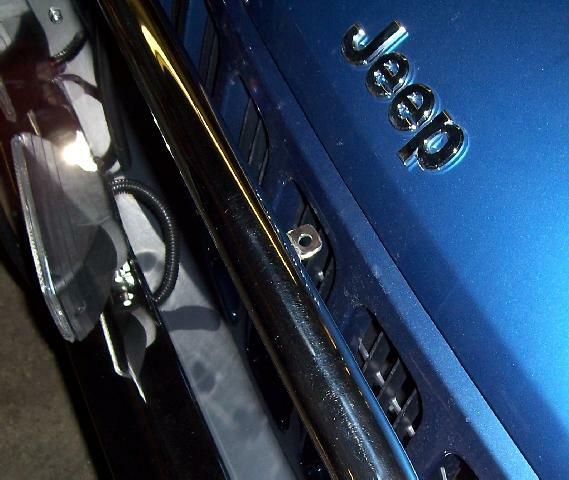 Then you mount the grille guard to the mounting brackets and it's done. I'm happy with the new guard. I have a place to mount the offroad lights and I can see much better as I search out the deer. The guard doesn't block my fog lights or blue lights, either. Since it didn't come with instructions I don't know what this tab is for. Anyone know?